Jim is one of the leaders of the firm's motor vehicle group. He is also a senior member of the firm's litigation group and its intellectual property group. Jim has litigated commercial cases for, and counseled motor vehicle and other franchisor clients, on a broad range of legal issues, including dealer establishment, relocation and termination, market encroachment, warranty reimbursement disputes and policies, national product allocation systems, facility and site control regulation, minority dealer representation programs, advertising regulation, antitrust regulation, franchise transfers, Dealer-Day-in-Court Act claims, gray market trading, dealer and distributor licensing, company-owned dealerships, copyright and trademark infringement, product marketing, and consumer fraud regulation. 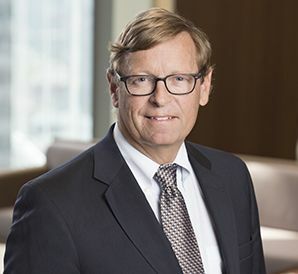 He has also litigated cases in state and federal courts throughout the country, including actions involving land use planning, tax increment financing, zoning, commercial class actions, trade secrets, restrictive employment covenants, whistleblower employee termination, antitrust claims, lender liability, environmental regulation, condemnations, truth-in-lending claims, and claims under the federal Racketeering Influenced and Corrupt Organizations (RICO) Act.